Rodinia was a supercontinent that preceded the more famous Pangea, which existed between 320 million and 170 million years ago. In a new study, scientists led by Zheng-Xiang Li of Curtin University in Perth, Australia, argue that supercontinents form and break up in alternating cycles that sometimes preserve the surrounding superocean and sometimes collapse the superocean, recycling the entire superocean's crust back into Earth's interior. A rare view of the divide between two continental plates is visible at Thingvellir National Park in Iceland. This chasm divides the Eurasian continent from the North American continent. There are patterns in the circulation of the mantle (the layer beneath Earth's crust) that seem to match nicely with this 600 million-year cycle, Li said. But some mineral and gold deposits and geochemical signatures in ancient rock reoccur in a longer cycle — one that's closer to a billion years. 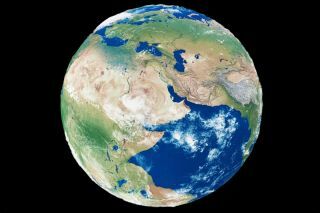 In a new paper in the April issue of the journal Precambrian Research and just published online, Li and his colleagues argue that the Earth actually has two concurrent cycles running: a 600 million-year-long supercontinent cycle and a billion-year-long superocean cycle. Each supercontinent breaks up and reforms by two alternating methods, the researchers hypothesize. Li and his colleagues used modeling to argue that over the past 2 billion years, introversion and extroversion have alternated. In this scenario, the supercontinent Nuna broke apart and then formed Rodinia via introversion. Nuna's superocean thus survived to become Rodinia's superocean, which scientists have dubbed Mirovoi. Nuna and Rodinia had similar configurations, Li said, which bolsters the notion that Nuna simply broke apart and then came back together again. But then, the oceanic crust of Mirovoi began to subduct. Rodinia pulled apart as its superocean disappeared. It slammed back together on the other side of the planet as Pangea. The new ocean that formed as Rodinia rifted, and then it became Pangea's superocean, known as Panthalassa. Pangea, of course, rifted apart to become the continents we know today. Panthalassa's remnants survive as the Pacific oceanic crust. The past 2 billion years of history posited in the new research are plausible, said Mark Behn, a geophysicist at Boston College and Woods Hole Oceanographic Institution, who studies Earth's deep history but was not involved in the new research. However, it's hard to know whether the cycles studied represent a true, fundamental pattern. "You only have three iterations, so you're trying to extrapolate trends out of not very many cycles," Behn said. Earth's supercontinent future remains unclear. Models that attempt to combine the movements of Earth's continents with the internal dynamics of the mantle could help determine if the introversion/extroversion assembly methods are realistic, Li said. The methods used by Li and his colleagues, which involved studying molecular variation patterns in ancient rocks, are probably on the right track for tackling these fundamental questions of plate tectonics, Behn said. Ultimately, Behn said, the question comes down to what drives plate tectonics. No one knows what triggers the start of subduction at a particular place and time, he said. There is even debate about when Earth's plates started sashaying around. Some scientists think plate tectonics began soon after Earth formed. Others think it started 3 billion, 2 billion or a billion years ago. "The data for these things is just coming of age," Behn said, "and we're only now being able to start pulling the pieces together." Editor's Note: This article was updated to clarify that superoceans can't break up like continents.